If you’re new in town or are just turning 18, be aware that if you want to vote in the state primary election on Tuesday, September 4, you must register to vote by three weeks before that date: Wednesday, August 15. You can use the state’s Online Voter Registration system or do it the old-fashioned way by visiting the Town Clerk’s office on the second floor of Town Hall, 730 Mass. Ave., with its charmingly irregular hours of operation (Mon-Wed 8 am-4 pm, Thurs 8 am-7 pm, Fri 8 am-noon). Spread the word! Some day, we may achieve same-day registration, but that day is not yet. The candidates for Middlesex County District Attorney and for Governor’s Councillor for District 3 will debate on Tuesday, July 24 from 7 to 9 p.m. at First Parish Arlington, 630 Massachusetts Ave., Arlington. The event is free and open to the public. accountable only to voters. Learn more about the power DAs wield in our communities – and hear from the Middlesex County District Attorney candidates. You will also hear from candidates for the Governor’s Council, which has the power to approve the appointments of judges and Parole Board members. The event is nonpartisan: co-sponsors are the ACLU of Massachusetts, the Leagues of Women Voters of Arlington, Lexington, and Winchester, Arlington Community Media, Inc. (ACMi), and the Mass Incarceration Working Group of First Parish Unitarian Universalist Church, Arlington. Join Senator Markey and America’s leading climate change experts for a summit on one of the greatest crises of our time. Following a discussion of the current state of affairs of climate policy and solutions, questions will be taken from the audience. Associate Member Jordan Weinstein has conducted interviews with both Democratic candidates for Lt. Governor. You can find the interviews on Facebook (Massachusetts Progressive Forum) and YouTube. The ADTC and Common Cause Massachusetts sponsored a well-attended forum on voting issues in March at the Arlington Senior Center. Here’s a detailed report on the event. Members of the large and appreciative audience (in front, Jimmy Tingle, candidate for Lieutenant Governor). 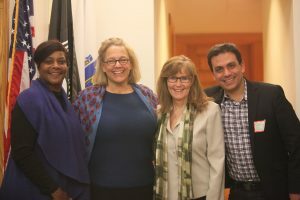 The voting issues forum speakers and the ADTC chair: Cheryl Clyburn Crawford of MassVOTE, Joyce Hackett of Lift Every Vote, Aimee Coolidge, and Greg Dennis of Voter Choice MA. Associate Member Jordan Weinstein has conducted interviews with all three Democratic candidates for Governor. You can find the interviews on Facebook (Massachusetts Progressive Forum) and YouTube. Concerned about how well our electoral system lives up to the promise of democracy? Looking for a way to ensure voting rights and fair elections in MA? Want to know what reforms will make a difference in MA and how you can be involved in current efforts to effect change? The Arlington Democratic Town Committee is pleased to host a community event on elections and voting rights. The forum features leading experts and activists working on electoral reforms to ensure a fair, accessible, open, and functional democratic system. The event will include an interactive, working group component to equip you with the contacts, resources, and tools to get involved! The forum, A Crisis of Democracy: A Forum on Elections and Voting Rights, will take place on Tuesday, March 27 from 7 to 9 p.m. at the Arlington Senior Center, 27 Maple St. Panelists include Cheryl Clyburn Crawford, Executive Director of MassVOTE, Greg Dennis, Policy Director of Voter Choice MA, and Joyce Hackett from Lift Every Vote. Pam Wilmot, Executive Director of Common Cause Massachusetts, will moderate the panel discussion. A crowd of nearly 160 packed Town Hall Auditorium February 10 and elected 36 delegates to the 2018 Massachusetts Democratic Convention. 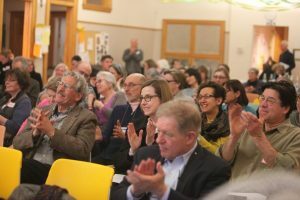 Almost a third of the crowd were newcomers to local Democratic politics, and 20 voters changed their registration to Democratic to participate in the caucus. Aimee Coolidge, Chair of the Arlington Democrats, cordially welcomed the newcomers and new registrants and encouraged them to stay involved. Elected as delegates were Carole Allen, Thomas Allen, Robert Ames, Robin Bergman, Lynn Bishop, Shane Blundell, Colin Bunnell, Eric Chung, Stuart Cleinman, Maureen Crewe, Mary Cummings, Joseph Curro, Christopher Dimeo, Susan Doctrow, Anne Ehlert, Catherine Farrell, William Gardiner, Jeffrey Goldberg-Zieger, Mel Goldsipe, Amy Goldstein, Irwin Grossman, Sharon Grossman, Camilla Haase, Adele Kraus, June Lipton, Jeffrey Maxtutis, Thomas Michelman, John Page, Judson Pierce, Jennifer Roderick, Paul Schlichtman, David Swanson, Stephanie Swanson, Rieko Tanaka, Robert Tosi, and Sandra Vorce. Alternates are Arthur Goldsipe, Laura Kiesel, Lisa Pedulla, Arthur Prokosch, Susan Stamps, and Jordan Weinstein. Chair Aimee Coolidge will serve as an ex officio delegate. Other Arlingtonians serving as ex officio delegates are Patricia Deal, Heather Fowles, and James DiTullio, all of whom serve on the Democratic State Committee, as well as State Representative Sean Garballey and State Senator Cindy Friedman. Several candidates for office came to meet caucus attendees, as did current officeholders Congresswoman Katherine Clark and State Treasurer Deb Goldberg. Well-organized, committed supporters of both Jay Gonzalez and Bob Massie for Governor ran slates of candidates for delegate. (Bob Massie came to the caucus.) The Gonzalez supporters had a slight majority and elected most of the delegates. Youth, minorities, and people with disabilities who were not elected as delegates or alternates may apply to be “add-on” delegates. The Convention will be held on Saturday, June 2, 2018 at the DCU Center in Worcester. Democrats from across the state will gather to endorse candidates for the September primary election. For more details on the convention, visit the Massachusetts Democratic Party website. At our Town Day booth Saturday, September 16, we welcomed Arlingtonians interested in getting involved with the Democratic Party for 2018. Our State Representatives and State Senator stopped by, along with at least one candidate for Governor. Thanks to everyone who visited! 50% of all registered voters in Arlington are Democrats. True or false? You can pre-register to vote in Massachusetts at age 16. True or false? Eleanor Campobasso is the only female Arlington resident ever elected State Representative. True or false? The Arlington Democratic Town Committee heartily congratulates Cindy Friedman for her victory in the Democratic primary for the 4th Middlesex District State Senate seat left vacant by our loss of Sen. Ken Donnelly. We also congratulate Rep. Sean Garballey and Mary Ann Stewart for their fine and hard-fought campaigns and their commitment to public service. The general election will be Tuesday, July 25. There is at least one opposition candidate, so make sure to vote! To join our mailing list, use the Contact Us link on the right. Arlington Democratic Town Committee | © Copyright 2018. All Rights Reserved.